There’s never been a better time to buy British. When it comes to off-road prowess, the new Land Rover Discovery Sport Diesel SW has got your back, come snow, sleet or good old British rain. Its 2.0-litre diesel engine has up to 178bhp, emits only 129g/km of CO2, and returns 57mpg. It’s as great for the environment as it is for getting you from A to muddy B-roads. Chuck in seven seats and an affordable price tag, and it’s difficult to understand why all families aren’t driving one of these. OSV takes a closer look to see what it’s all about with our 2017 Land Rover Discovery Sport Diesel SW review. For its size, the new Discovery Sport is surprisingly agile on the road. It’s composed too, which inspires confidence. Off-road, it’s just as capable. This is a major selling point, as it’s not usual to find an SUV that is just as good on the road as it is off it. This car has an advantage to that end – it’s based on the Range Rover Evoque, the kind of big brother who’s always got your back in the playground. However, a new rear suspension system helps it step out of its siblings’ shadow. 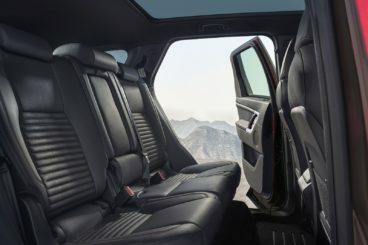 In so doing, not only is this car more comfortable, it also has more cabin space. At low speeds, the suspension will feel a bit firm. But at higher speeds, it does a grand job of softening the blow from poorer surfaces. Unfortunately, though, the Discovery Sport Diesel SW doesn’t get its older brothers’ much-praised MagneRide suspension setup. The Land Rover steers well, and it feels almost car-esque. It’s responsive, and even entertaining on weaving roads. The steering does lack feedback, which means you don’t always know what your front wheels are doing. But with lots of grip, the car is hassle-free to drive. Four-wheel-drive comes as standard, and optimises grip whenever you need it. The car’s Terrain Response system lets you modify your driving setup, so that you’re able to better deal with different surfaces, including thick snow. The car can also keep going in waters 600mm deep. In terms of the engines, there is only one available. It’s a 2.0-litre Ingenium diesel unit that’s hot off the production line. This state of the art engine is cheaper to run than the last one, and provide a smooth, quiet driving experience. You can get it in either 148 or 178bhp guise, with the former only available if you opt for the e-Capability line. You’ll be using the throttle a fair amount, despite the engine not being what you’d call slow. It does 0-62 in 9.9 seconds, and comes wedded to a 6-speed manual ‘box, which suits this e-Capability model well. However, the 9-speed automatic transmission that’s paired with the 178bhp variant is much better. You use a rotary dial to operate it, and the engine ticks along nicely at low speeds most of the time. The 178bhp variant does 0-62 in 8.4 seconds, before maxing out at 117mph. When compared to more upmarket rivals, the Land Rover certainly doesn’t look out of place. It’s perhaps missing a bit of imagination on the design front. But apart from that, this is an excellent cabin whose build quality is second to none. The dashboard has been carefully crafted, with the controls easy to reach. Unfortunately, Land Rover gave less thought to where they were going to put all the buttons, and so piled them onto the steering wheel. It looks awkward and overwhelming, and it may take you some time to get used to them all. Just be careful you don’t press the button for the ejector seat by mistake (we’re joking). As ever with a bulky Land Rover, the controls and buttons are hefty. This is because it’s expected that a lot of drivers will be fiddling with them while wearing gloves. It’s not all agricultural, though; a sweet rotary gear selector emerges from the centre console like a Phoenix in what is a nice touch. You can also choose a lighter trim so that the interior doesn’t feel unpleasantly dark. Doing so will show up the dirt more easily, of course. But it’s another nice touch. Still, most of the cabin is robust. You’ll notice some cheaper plastics, too. No doubt one of the biggest selling points of the interior are the seven seats. Despite being no bigger than a VW Golf, the seats are comfortable, supportive, and there is a decent amount of space. Opt for the e-Capability model, and you only get five seats. Legroom can be improved by easily sliding the second row forwards and backwards, and adults can fit into the third row of seats. We recommend they only sit there for shorter trips, though. Access is easy, thanks to the fact that the doors swing open nearly 90 degrees, while the boot measures 981-litres when the third row has been folded. Standard kit is good, and includes climate control, seven seats, an 8” colour touch screen, and cruise control. The entry level model is also decked out in part-leather upholstery. The SE Tech is our top pick. It comes with a power-operated boot lid, front fog lamps, sat nav, and automatic wipers and headlights. Step up to the HSE model and you get a full leather trim, a reversing camera and a panoramic sunroof. The HSE Luxury trim rounds things off with heated rear seats, and front seats that have both cooling and heating functions. It’s reassuring that the car scored 5/5 when crash-tested by Euro NCAP. It scored especially highly in the pedestrian, child and adult categories. Standard safety kit includes 9 airbags, electronic stability, a pair of ISOFIX child-seat mounts, and Terrain Response. Prices for the new car start out from £31,255 and rise to £47,115. For more information on our leasing deals, check out our page here. In terms of its running costs, the diesel engines are efficient. There are two available – a 148 and 178bhp variant of a 2.0-litre engine. The former returns a claimed economy of 57.8mpg, while the latter is good for 53.3mpg. These are good, fairly competitive numbers. However, achieving 53.3mpg in the real world will be tricky. Emissions are low, too, with the less powerful model emitting just 129g/km of CO2. The versatility of the seven seats is a real selling point, and no doubt a reason the car has already won a few awards. It’s easily Land Rover’s coolest-looking model on the road to date. There’s nothing wrong at all with the driving dynamics. Despite its size, it drives like a hatchback. Rivals are cheaper to run, with no diesel here returning over 57.8mpg. Were you to check what the petrol and hybrid models offer, you’d be disappointed – there aren’t any. All you’ve got to choose from is a 2.0-litre diesel in either 148 or 178bhp guise. Let’s see how the car fares against its rivals in the comparison section of our Land Rover Discovery Sport Diesel SW review. 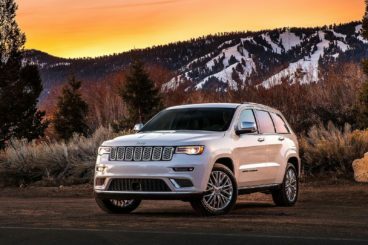 The new Jeep Grand Cherokee Diesel is one of Jeep’s biggest ever cars. It’s a bold-looking thing that locks horns with the Land Rover – and which may come out on top. Jeep, along with Ford, is one of the few American brands that are really taken seriously by us Brits. But unlike the Yankees’ usual taste for cars that are exciting to drive, the Grand Cherokee is more comfortable than fun. Body lean will become apparent if you drive it with too much enthusiasm, while passengers might get a bit woozy. Unexciting handling is not a bad thing. Sure, it’s not going to provide thrills and spills out in the country, but its powerful engine and light steering make for a hassle-free driving experience. It makes for a fine cowboy whenever you want to take it off-road, too. It’s worth remembering that Jeep have been making capable off-roaders since the Second World War, so they know exactly what they’re doing. The Grand Cherokee’s five-mode off-road controller ensures it can easily match the Land Rover for off-road skills, with the TrailHawk model being your best bet if you plan to rough it often. There is only one diesel engine available. It’s a 3.0-litre unit that does 0-62 in 8.2 seconds, and is a sensible option, not least because of its running costs. It returns 40.4mpg economy on average. In isolation that doesn’t sound fantastic, and the Land Rover is much more frugal. But if you were to consider a petrol Grand Cherokee, you’d have to be content with returns of 20.9mpg at best. The Jeep’s diesel engine is a gruff one, though, and its bark will find its way into the cabin. That detracts somewhat from the comfort you could have otherwise enjoyed, and the interior on the whole is hit and miss. The plastics on the dash are much more upmarket now, the seats are more supportive, and five people will have a good amount of room. The boot measures 782-litres. This is actually competitive for this class, but miles off the Land Rover. The new Lexus NX is a daring-looking SUV that looks like something out of the future. It looks so much more distinctive than either the Land Rover or the Jeep that its style is either going to repel you immediately or intrigue you. Lexus like to buck trends, and ask you to do the same. That said, the driving experience of the NX is a little on the bland side. It’s comfy enough, but there isn’t much feedback from the controls. Moreover, it’s not as grippy and composed as we’d like. The entry-level model misses out on four-wheel-drive, which is a disappointment. It also doesn’t get hill-descent control, an essential in a car like this. The engines include a hybrid, which pairs an electric motor with a 2.5-litre petrol unit for 195bp. That sounds like enough, but it lacks power. Worse still, the automatic gearbox creates a racket that grates. The 200t petrol model that develops 235bhp is a better bet. Even so, it has its inadequacies – for example it’s sluggish to react. However, it weighs less than the hybrid, which helps to boost its agility. Its 6-speed automatic transmission is worthy, too, and helps with cruising and acceleration. In terms of running costs, the hybrid returns a respectable 56.5mpg. That’s respectable, not as frugal as the Land Rover, a car that itself is far from class-leading. The petrol engine, meanwhile, returns 35.8mpg. That doesn’t sound too disastrous, but it will be hard to achieve such numbers. 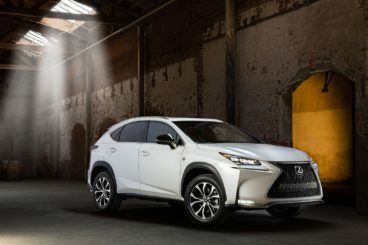 Inside, the Lexus NX boasts a funkily designed dashboard, supportive seats, and lots of upmarket materials. The cabin is luxurious, solidly built, and comes with a smart infotainment system that’s controlled via a touchpad. It’s a practical car. A raised driving seat ensures good visibility, and the steering wheel comes with lots of adjustability. Anyone sat in the back will find their headroom is limited by the raised seats. But a lack of a raised transmission tunnel means middle seated passengers get an easy ride for once. The boot measures 475-litres, which is way smaller than the Land Rover and the Jeep. It measures 580-litres in other countries, but here in Britain we get a space-saver spare wheel. You decide what you’d rather have. British products just don’t come much better than this. 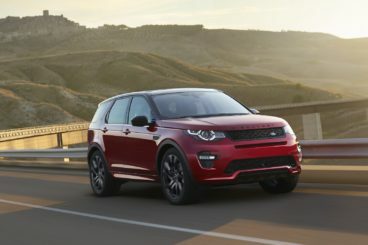 If you’ve never bought British before and need a sweet-looking, seven-seat SUV that drives like a much smaller hatchback, you needn’t look any further. The Land Rover Discovery Sport Diesel SW is just as premium as a standard Range Rover but comes with a much lower price tag. Cheers!